knocked out by all the action. For the first time, collected under one roof – that of the San Francisco Wax Museum at Fisherman’s Wharf – are all the "MINIMOVIES" that John Stanley produced during his six-year run as host of CREATURE FEATURES at KTVU Channel 2 in Oakland, CA. 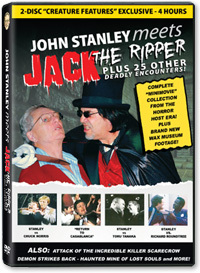 The Wax Museum becomes Ground Zero for new footage shot for this 4-hour, 2-disc extravaganza as Stanley "bumps into" the notorious London knife murderer (portrayed by San Francisco actor Carlos Tabarez) and is taken on a journey through the Chamber of Horrors. With Jack’s help, Stanley relives those short but impactful films that spoofed genre movies and sometimes featured all-star casts. Chuck Norris, Robert Bloch, femme fatales Lee Grant and Carol Kane, "Tall Man" Angus Scrimm, and director Don Coscarelli are among the participants. Relive such unforgettable classics as NIGHTMARE IN THE CHAMBER OF HORRORS (cut into two chilling halves), THE MUMMY RISES (Stanley gets all wrapped up in this one) and HAUNTED MINE OF LOST SOULS, with a shaft awaiting everyone. Each was filmed in the atmospheric, oft-tingly Wax Museum, considered to be one of the best in the world. TAKEN FOR A RIDE (aka JOHN STANLEY MEETS E.T. 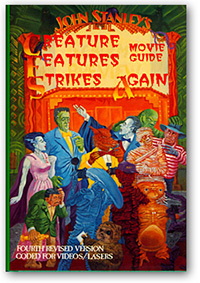 ), MEETING AT MORNINGSIDE (with an ensemble "Phantasm" cast) and THE STANLEY CAGE (filmed at the San Francisco Zoo with shapely Lee Grant and Carol Kane) are all reminders of the unique attraction CREATURE FEATURES had on a generation of Bay Area viewers as Stanley tried to break out of the studio-bound mold to entertain his loyal Saturday night audience. Martial-arts fans will chuckle and gasp as Stanley faces off against Chuck Norris in GOOD TV HOSTS WEAR BLACK. After getting pummeled by Norris, Stanley makes a comeback in RETURN OF THE CHANNEL 2 DRAGON, and then has a third spectacular encounter with Norris in the two-part REVENGE OF THE CHANNEL 2 DRAGON. This remarkable minimovie was made on location in Orinda where Norris was making AN EYE FOR AN EYE in 1981, and features a guest appearance with Norris’ costar Richard Roundtree, who holds Stanley at .45 caliber gunpoint in two near-deadly encounters. Then there’s S*Q*U*A*S*H and SQUASH II when Stanley has two encounters with karate champion Toru Tanaka. Stanley takes on the garb of a hardened private eye in LITTLE SHOP OF MURDERS (with two shapely dames luring him into the depths of their feminine wiles), then transitions into Sherlock Holmes garb (complete with magnifying glass) in ADVENTURE OF THE PERSIAN SLIPPER. helping a distressed beauty at a Holiday Inn. He also enters a sinister, dangerous world in RETURN TO CASABLANCA, paying homage to Humphrey Bogart’s Rick Blaine. And faces formidable opponents in REVENGE OF THE TIGERS. It’s one slam-bam jarring smash after another. Other deadly encounters: CHRISTINE THE KILLER CAR: ALL REVVED UP (Stanley trapped in the fast line) . . . THE DEMON STRIKES BACK (a roller coaster ride into another dimension) . . . ALL HEART (Stanley is abducted by black-market organ stealers). One of the most spectacular minimovies is the two-parter, ATTACK OF THE INCREDIBLE KILLER SCARECROW, in which a corncob demon terrorizes Stanley and private detective Don Herron, of Dashiel Hammett walking tour fame. He’s even attacked by a Mexican bandido in NO STINKIN’ BADGES. Bonus Features: THE GRAND INQUISITOR (2008, 21 minutes). A horror-mystery tale written and directed by Eddie Muller. Starring famed noir actress Marsha Hunt and Leah Dashe. documentary edited by Wayne Hess (2010, 15 minutes). John Stanley at 1082 Grand Teton Drive, Pacifica CA 94044. Price: $20 - Please Add $3 for postage and handling - total $23. Film Noir, a type of crime film in black-and-white that flourished at the major Hollywood studios in the 1940s and 1950s, has become one of the most popular genres to a legion of dedicated followers all across America. Contributing to that popularity is the Noir Film Festival, which for ten years has been presented in five major cities by Eddie Muller, a one-time San Franciscan (now living in Alameda) who grew up seeing these films about the dark side to the American dream. Gritty, hard-hitting glimpses into the underbelly of American culture as criminals, femme fatales, immoral private eyes and corrupt cops step into the deepest of shadows to pursue greed, lust and power. Muller, whose voice has delivered countless commentaries for commercial film-noir DVD releases, is also creator of the Film Noir Foundation, a non-profit organization responsible for salvaging noir films that would have otherwise been lost and unseen. Examples are CRY DANGER and THE PROWLER, among many. 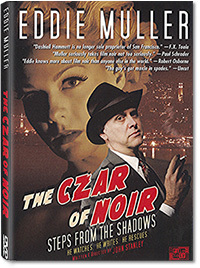 CZAR OF NOIR details the history of noir in American cinema – but also reveals the obsessed, personal side to Eddie: how he was first introduced by his father, a San Francisco journalist who specialized in boxing, to a world that was purely “noir.” Eddie went on to write five non-fiction books about the history of noir and is also author of the best-selling autobiography of actor Tab Hunter. In an in-depth interview with one-time “Creature Features” host John Stanley, Eddie describes the history of noir set against an array of dynamic film clips from such classics as THE MALTESE FALCON, THIEVES’ HIGHWAY, THE BIG COMBO, GILDA and THE BIG SLEEP. Ironically, teen-ager Eddie first met Stanley when he was an entertainment writer for the San Francisco Chronicle, and credits Stanley with inspiring him to want to write about noir. Bonus features: Eddie’s 21-minute 2008 horror-mystery short, THE GRAND INQUISITOR, starring film-noir actress Marsha Hunt as a strange woman living alone in a disheveled home that might have once been the secret haven of a serial murderer. THE MAKING OF THE GRAND INQUISTOR is a behind-the-scenes documentary featuring interviews with Hunt and her co-star Leah Dashe. 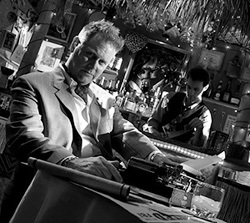 More information about Eddie Muller and his “noir” enterprises can be savored at www.noircity.com and www.filmnoirfoundation.org. 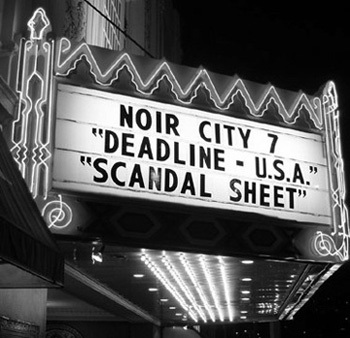 Also watch for his annual Noir City Sentinel, a collection of articles about old and new noir films which will be on sale after January 2010. 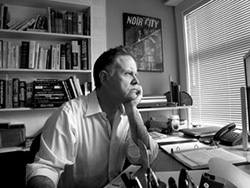 EDDIE MULLER (in his Alameda studio above, pondering his next investigation for missing film noir) continues to shake up America with his Noir City Festivals in five cities. Last January, during a ten-day run at the Castro Theater in San Francisco, he drew 13,000 spectators. To see old black-and-white crime and mystery films! It set a new record for his festival. Then, in July, Eddie was guest at the Paris Cinematheque for a special film noir program. His next Noir City at the Castro will be this coming January. That's Eddie below, at his favorite watering hole, trying to uncover a missing noir film. Word has it he's still looking. Battle Beyond the Sun, Godzilla vs Megalon. The Incredible Petrified World, Horror Express. for only $35 + $4 shipping. New Introductions by "Creature Features" host John Stanley Made at Playland-Not-at-the-Beach in El Cerrito CA - "Zapped into the Dimension of Doom" - "Tut Tut: The Mummy That Gave Off an Odor" - "Trapped in the Spider's Website" . . . Actor HARRY DEAN STANTON . . . A tribute to the war and horror comic book art of RUSS HEATH . . . San Francisco marketing guru BUTCH LEE . . . the DUCK'S BREATH MYSTERY THEATER . . . Sci-fi novelist HARRY HARRISON . . . Original commercials, station promotions and other period material. John Stanley visits the TOM WYRSCH "Creature Features" Archive/Screening Room/Library in Petaluma, CA. . . Classic four-part interview with actor/voice impressionist FRANK GORSHIN imitating famous Hollywood actors . . . MARTIN ROSEN, producer of WATERSHIP DOWN and THE PLAGUE DOGS. Original commercials, station promotions and other period material. Each set contains two discs in a standard 2-disc DVD case, with wraparound cover. These historic glimpses into television's past are on sale for $20 each. However, order both sets today and receive a $5 discount, or just $35. Original studio footage edited and transferred to DVD. • TRAILERS OF HORROR, a complete study of previews of coming attractions from the 1930s through modern time. Ample trailers are used. • Interviews with Gary "Dark Crystal" Kurtz, Charlton "Mother Lode" Heston, Ray "Something Wicked This Way Comes" Bradbury, plus a satirical "Bad Seed" sketch. • An insightful interview with Richard Franklin, director of "Psycho II," in which he gives insider informaiton on the original "Psycho" as well as on Alfred Hitchcock. 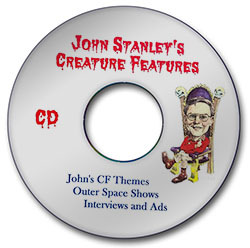 This DVD compacts some of the best material John Stanley did during his early years hosting CREATURE FEATURES. 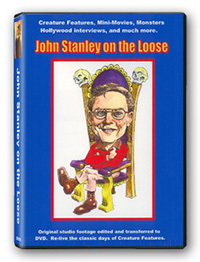 Selecting the best excerpts from countless interviews and minimovies, Stanley put together two hours of pure entertainment for a Christmas special of 1983. This includes the minimovies THE ADVENTURE OF THE PERSIAN SLIPPER (a Sherlock Holmes pastiche), LITTLE SHOP OF MURDERS (a visit to a mystery book store), ATTACK OF THE INCREDIBLE KILLER SCARECROW (a scarecrow contest becomes the site for Stanley's own "murder"), RETURN OF THE CHANNEL 2 DRAGON (going on location to record the making of a Chuck Norris action movie) and RETURN TO CASABLANCA (the Bogart legacy relived in a San Francisco restaurant called The Casablanca). Also in the mix are THE MAFU CAGE (at the San Francisco Zoo with Carol Kane and Lee Grant) and ALL HEART (Stanley is abducted so his body organs can be used as transplants). Among those interviewed are Leonard Nimoy, Ricardo Montalban, the major players from STAR WARS and countless others. A complete show that in the summer of 1982 dealt with the release of the second "Star Trek" feature film. 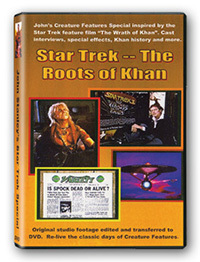 Stanley featured interviews with Ricardo Montalban, William Shatner, Leonard Nimoy, DeForest Kelly and others. Highlighted is special effects master Ken Ralston from ILM, who visits the Creature Features set. Stanley reviews the new film and discusses aspects of Spock's so-called "death." A bonus feature is a 1980 Leonard Nimoy interview in which "Spock" discusses the first "Star Trek" feature film and other phases of his burgeoning career in theater, TV film and literature. 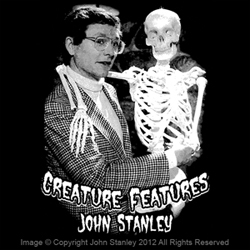 This two-disc set is a dazzling collector’s item mixing documentary material and classic interviews from the archives of “Creature Features” host John Stanley. 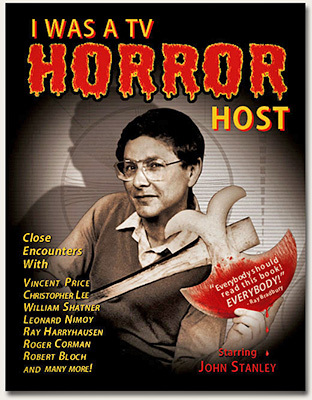 I WAS A TV HORROR HOST is a 50-minute documentary in which Stanley recounts the story of how his San Francisco-Bay Area based series became one of the most popular TV offerings of its kind for 14 years with co-host Bob Wilkins a major part of the history. 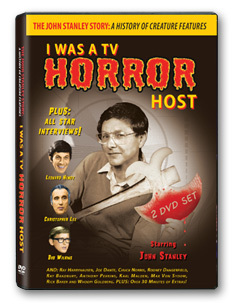 With newly shot material, old clips and historic photographs, I WAS A TV HORROR HOST gives a behind-the-scenes recounting. Much of the new footage was shot on locations major to the historical story. CELEBRITY INTERVIEWS include such sci-fi & horror stalwarts as Leonard Nimoy, Christopher Lee, Ray Harryhausen, Chuck Norris, Joe Dante, Anthony Perkins, Arnold Schwarzenegger, Max Von Sydow and Rick Baker. Also included: Karl Malden, Rodney Dangerfield, Whoopi Goldberg and Bob Wilkins himself. All taped during the golden age of TV horror hosts. Return with us now to those glorious days of yesteryear when resounding CREATURE FEATURES themes (totally different from those of previous host Bob Wilkins) crashed through the ears of hundreds of thousands of San Francisco-Bay Area viewers. You will also enjoy offbeat interviews and advertisements for upcoming shows. Lend an ear and you will cheer. 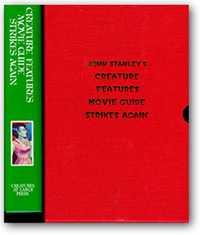 This remains John Stanley's favorite movie guide - subsequent editions five and six from New York publishers would be heavily edited and many of his 5,614 film reviews would never see print again. Stanley goes all out with this collection of reviews of all genres in the cinefantastique category: science-fiction, fantasy, horror, weird mystery, slasher/basher flicks and other subgenres that defy description. And don't forget all the movies-made-for-TV and direct-to-home-video classics and nonclassics. Scores of these films were never reviewed in any of the other major movie guides of the time. There are also 1,709 cross references to secondary titles, 232 photographs of popular monsters, actors and historic scenes . . . and artist Kenn Davis has provided 24 brand-new drawings to kick off each letter of the alphabet. Identical to the trade version but this comes in a beautiful hardcover format with dustjacket. There is also a heavy-duty slipcase with the title of the book embedded upon its finesse. Inside is a special page with the number of the book (1,040 were printed) penned in. Each of these will, of course, be autographed to the buyer or to whomever the buyer specifies. This appears to be modest compared to the editions that followed it - especially when compared to the fourth edition that came to represent John Stanley's non-stoppable task of reviewing thousands of movies over the next 14 years. However, it does mark the beginning of the long-running series, and hence should be of historic importance to those who have collected the other editions. Unless you can find a copy in used bookstores or on e-bay, this website is the major source for this rarity. There are but a hundred copies left in my garage, if a curiosity for this rarity should overhwelm you. There are 24 original Kenn Davis illustrations and scores of photographs, plus an introduction by the late great fantasy author Fritz Leiber Jr.
With the publication of the first eight short stories in the famous Lefty Feep series, Bloch and I had intended a trilogy of books, but his death from throat cancer in 1994 cancelled the plan. Hence, these are the only "Lefty Feep stories" in print since their initial debut in FANTASTIC ADVENTURES back in the 1940s. 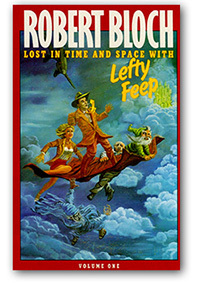 Feep was a famous comedy character from the pulp magazines much discussed but seldom read--which is why in 1987 I published the first batch with Bob's blessing. He wrote a brand-new story to enhance the effort. Besides my long introduction written in Bob's satiric Lefty Feep style, there is also a tribute by Chelsea Quinn Yarbro, one of the finest fantasy writers in the field. The book contains many original photographs taken by Stanley at Bloch's home in the Hollywood Hills. 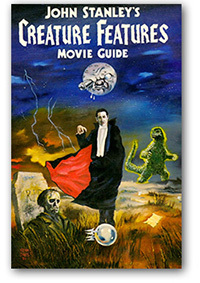 You can order CREATURE FEATURE books, DVDs, and CDs, via check or money order. Items are shipped by special "Media Mail" postal rate that takes about a week for return. If you would like faster, please include an additional $3.00 per order for Priority Mail shipment. Don't forget to tell John Stanley how you want your item(s) autographed, as he will sign to your specifications. Stanley welcomes all queries, comments, questions and wise-guy remarks.